One of the first steps to success is to start thinking successfully. To that end, we have designed The “Millionaire Mentality®;” pullover quality “LEE” sweatshirt. You’ll notice the difference as soon as you put it on. Those who have purchased this stylish cotton jersey sweatshirt have enjoyed its warmth, as well as its comfortable fit. This high quality “LEE” Cross Grain, 95% Cotton, 5% Polyester, longsleeve sweatshirt is designed for spring, cool summer days or evenings, fall and, of course, winter. Wear it wherever you would any fashionable sweatshirt. It will display to the world what you already know; that you have a winning mentality, a success based-mentality, a “Millionaire Mentality®”. 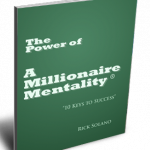 Put your Millionaire Mentality® on when you get up in the morning, and share it with the world. By telling others you create accountability and commitment, and you will not fail.